This subtle necklace celebrates female empowerment in elegant style. 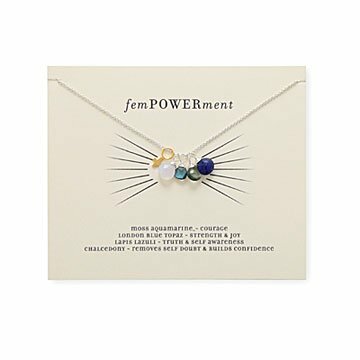 You don't need a superhero-size statement piece to be a strong woman: Just this subtle necklace, which celebrates female empowerment in elegant style. The piece's focal point is four stones in varying shades of blue, all representing inspiring traits. Courage, strength and joy, truth and self awareness, and confidence— you'll carry them all every day, whether it's to an interview, first date, or secret mission to save the world. Charms are cast in Thailand, then sculpted in Italy. Stones are hand-cut in India. Hand-assembled by Mary Steratore in Pittsburgh, Pennsylvania. This beautiful gift will relay to her how we feel about her wonderful qualities of courage, strength, confidence and caring for others. Our love and pride Go with her! Wonderful gift! Meaningful and stylish! This product is a great gift or treat for yourself. I bought this for my sister and she cried when she saw it.She wares it all the time. This necklace is perfect-the right length, can wear everyday, and makes a powerful statement for a strong woman!